WJSG Internet Radio: Sit! Staaayyyy. Play Music! Good Dog! Sit! Staaayyyy. Play Music! Good Dog! Riding on the popularity of other interactive pets, like Hasbro’s Furby and Mattel’s Figit, comes the TechPet from Bandai. TechPet is basically an update of the Tamagotchi, the virtual pet that Bandai introduced in the 1990s. It has a rather generic name for a playful, interactive puppy; fortunately, you can rename it once it’s yours. You can also feed it, pet it, groom it and teach it tricks — everything you would normally do with a live puppy, except clean up after it. The TechPet is compatible with the iPhone 3, 4 and 4S and the fourth-generation iPod Touch. 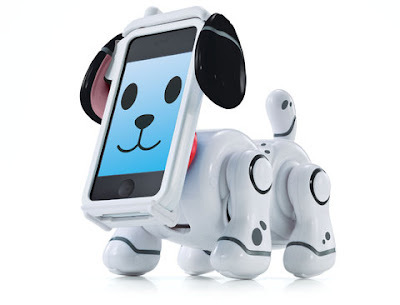 After downloading a free app, place your device in the TechPet’s cradle, and it displays the puppy’s smiling face. But that face can also frown and get sick, so you have to give it lots of attention. At first, the TechPet has a limited supply of digital food and accessories. But the more attention it gets, the more features it unlocks. It can also walk and dance, although I couldn’t get it to take more than a few jerky steps. Maybe I need better doggie treats. It’s easy to get bored playing the games and activities the TechPet offers. They are either too simple or too clunky. Bandai says this toy is intended for children ages 12 and up, but that target age seems a little high. Granted, I’m not a tween, but I can’t imagine anyone older than 12 getting much enjoyment out of the TechPet. But my biggest issue with the TechPet is Bandai’s shortsighted decision to make it compatible only with older Apple products. If you have a newer phone like the Samsung Galaxy S3 or the iPhone 5, you’re out of luck. Why make a new tech gadget that works only with older devices? The TechPet;s retail cost is $60 and is available at Toys ‘R’ Us and Amazon.com, but some might prefer a live pet, because this puppy needs some remedial training.